Feature updates are the major updates that are typically delivered twice yearly. They are usually a large download that can take 10 or minutes to install. Feature Updates were previously called a version upgrade and contains new features. Each Feature Update has a major version number based on it’s date of release (yymm). Version 1709 was finalized in September 2017. 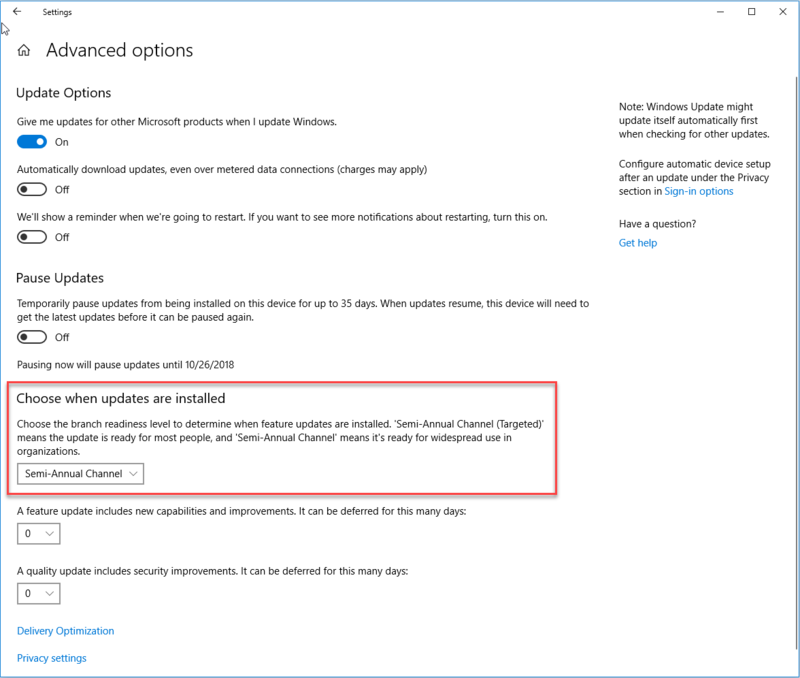 By default all Windows 10 PCs are set to the Semi-Annual Channel (Targeted), this was previously known as the Current Branch. Computers in this channel get updates soon after they are released by Microsoft. The Semi-Annual Channel would be the setting for business, and was formerly called the Current Branch for Business. After Microsoft determines that any reliability and security issues have been addressed during the first few month of release it will declare the version ready for deployment to the Semi-Annual Channel. Quality updates do not include new features but are security and reliability fixes. They are cumulative so that if you skip several months of these when you install the latest cumulative update you will be completely up to date. 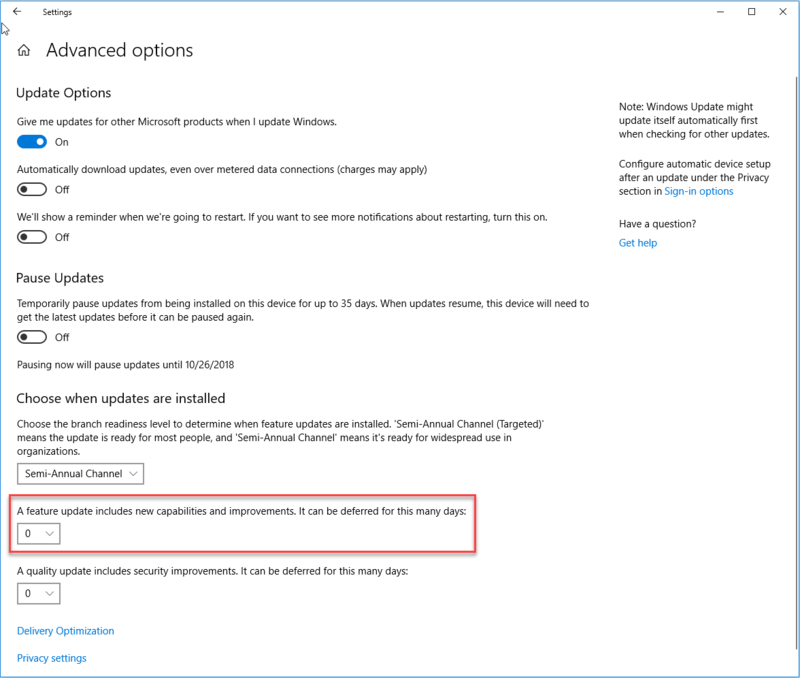 Quality Updates are released on the second Tuesday of each month, also called Patch Tuesday to their supported branched. All security and reliability updates are included in a cumulative update and cannot be selected or deselected on an individual basis. In addition to the cumulative updates hardware driver updates can be delivered through Windows updates, these are provided to fix bugs and instability issues with targeted hardware. You might also see servicing stack updates; these are update packages to fix problems in the code that Windows 10 uses to install other operating system updates. Also Windows Defender updates are delivered through Windows updates. Microsoft’s goal in this new approach to Windows 10 updates is to have most Windows 10 users fully updated at all times. 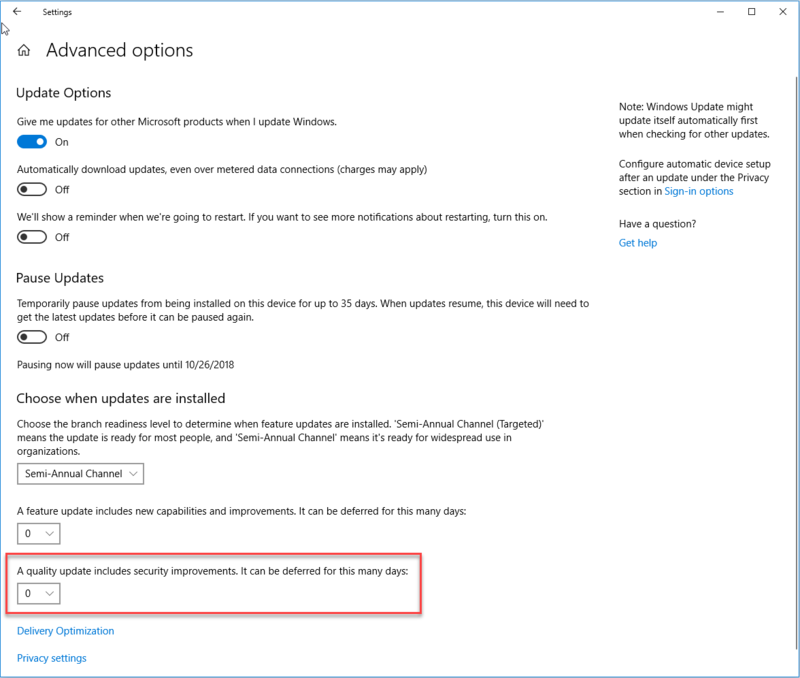 If you want to see which updates are installed on your system, go to: Settings > Updates & Security > Windows Update and click on View Installed Update History. Also, if you want to check and see if your PC is up to date, on the same Windows Update page click the Check for updates button, Windows Update and will check for any available updates and report the results.